I’ve discovered a new journal app called Daylio that is unique and while missing many of the features listed in this roundup is worth consideration. You can read my review here. I did a little research to see what has changed in the journal landscape to update this article. I did not find any new apps to add to the list and currently feel that the two top apps to consider should be Journey and Day One. Journey has continued to get great updates and has expanded their offering to Windows, Mac, and iOS along with their support for Android and Chrome via an extension. Day One has expanded adding support for Android and has begun to add some limited cloud functionality which allows you to sync data and view it, albeit read only for now. I’ve made a few updates to the listings below as well. I reviewed my original post and took a look to see if I could find any new apps and services out there. Below is a list that contains new apps along with some from my original post that contain all of the above features and more. If you need a reason or inspiration as to why you should keep a journal, look no further than this great post on “Why Keeping a Daily Journal Could Change Your Life“. This is a very elegant app with a nice UI and design that reminds me of Day One which is an IOS only app (see below). It’s chock full of many of the same features as well. The Chrome extension is used to write entries from your desktop and it syncs to Google Drive. You can also selectively publish posts to your social sites if you want. As 2017 ends you can see that they continue to make improvements to the user interface and design and they are still adding many new features. You can login through the website and read your posts as well as add new ones. The web interface doesn’t offer all the features of the dedicated desktop or mobile apps but it’s nice to have that as an option and it’s included for free. The pricing model for the software is a little confusing with several different pricing options for the mobile app ($4.49), desktop software ($14.99) and cloud annual subscriptions ($29). However the free offering is very generous and you can test out quite a bit of the features before deciding to upgrade. You can read a full review of this app here. This app has been praised as the premiere journal app for IOS. It stands out with its beautiful design and strong feature set. To create entries on the desktop requires purchasing the companion Mac app. If you’re an IOS / Mac user you should seriously consider Day One. 2017 has finally brought Android support and while the initial release isn’t as beautiful as the iOS version it’s great to see the support expanding. The new cloud support is a pretty basic and currently only offers the ability to read data that is synced. Also the cloud support requires the $25 annual subscription to access. Still this is definitely one of the top apps worth testing out to see if it meets your needs. Here’s a good full review of the app. 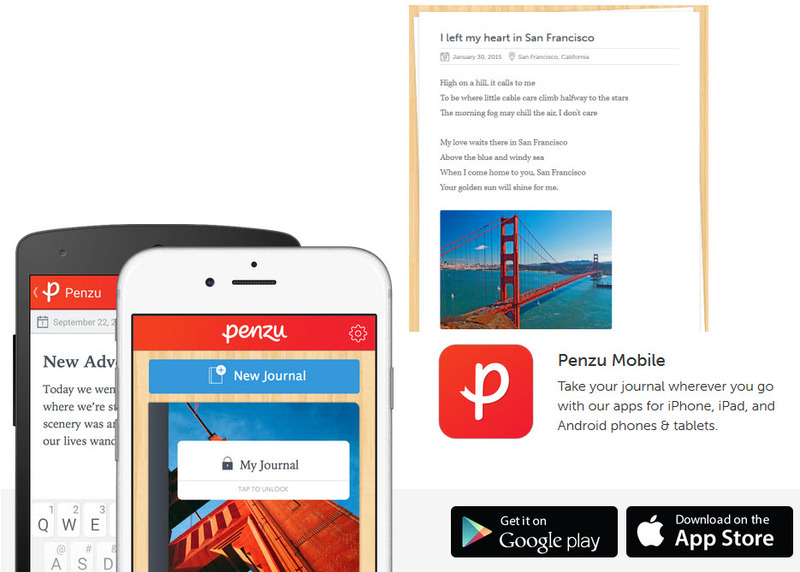 I like Penzu because it has a strong emphasis on gaining insight from your previous journal entries. This is done by using an algorithm that provides snippets of previous entries as reminders from old entries to help identify themes and give you inspiration for new entries. It’s also got a very robust web app. Here’s a detailed review. I really liked the features and flexibility of this app when I wrote my first review. It continues to be improved and has added support for iOS in 2017. You can read another review of it I found here. I’ve added Momento as an honorable mention because it doesn’t offer a cloud or desktop software access but is still a great stand-alone app with lots of great features. If you’re ok just having your mobile device as the only method to store and retrieve your journal then this app is worth your consideration. This may be one the oldest app on this list which I used when it initially was released. It as continued to be updated with features and the design is gorgeous. This app has integration with many third party apps and services and will automatically import their activity allowing you to automate some of your journal entries. This could be pretty convenient when you don’t find time or want to duplicate the content you’re already sharing publicly. 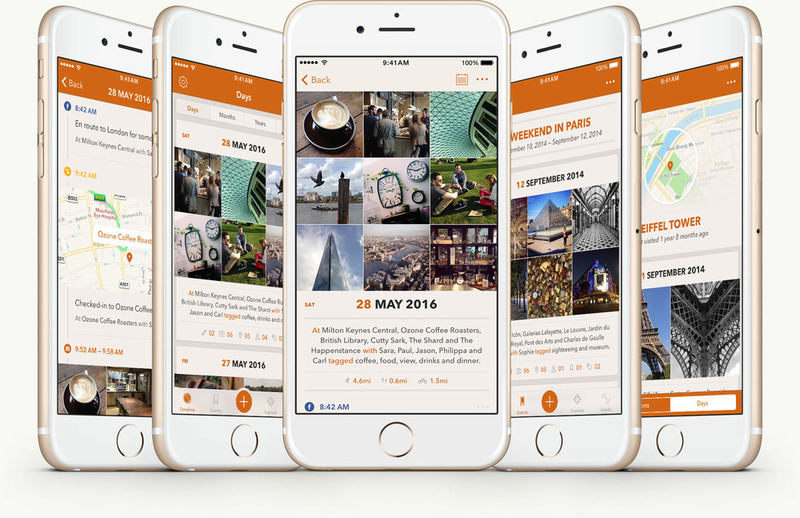 It will also allow you to create private journal entries only available from the app as well. You can start by downloading the free app and then through in-app purchases add additional features. Thanks for the list. Do any of them export to Dropbox Evernote? That would be really cool. Tac, several of them use cloud drives for syncing the data. Diaro and DayOne use Dropbox and Journey uses Google Drive. I’m pretty sure all of these can export your data to PDF files. Thank you for the list. Is there an app that imports your facebook status history? Not as a feed, but the actual statuses to reside locally or on the cloud for the app? Eve, I’m not aware of a journal app that can import Facebook status history but I do use an app called Digi.me https://digi.me/ that I use to import all my Facebook (and other services) data which it then lets me store on my computer. i used flava few years back. And recently i relogin and realized some of the memorable pics are gone…. i even contacted flava team and no respond from them. I’m really looking for a journal that will allow me to actually WRITE, like with the stylus, when I want to – any suggestions for that? So far, I’m only able to use note-taking apps, like NotesPlus, NoteShelf, and MetaMoji…which all have very nice ink engines. Unfortunately Mishell I’m not aware of any digital journal apps. as a blogger I was happy to read this post since it teach me on how to get mobile application in which currently relevant to.i have a blog and i m also a android mobile. I’ve been using One Day for a week. I thought I was happy until I realized that there is no way to include multiple pictures in the same entry. This is a deal breaker for me. They are adding this feature but only for another fee. Now that I know I have to pay a fee for something so basic I’m considering using the money to buy a different app. The 3 most important things to me after ease of use are being able to upload photos from my phone, upload multiple photos per entry, and easily back up my entire journal using an export to PDF. Can you suggest the best app with these features? Version 2 of Day One was just released today and it supports up to 10 photos per entry. Thought I would share. My only problem with the new version it will now only sync with their service. No more iCloud/Dropbox support. I felt better when I was able to store my data with iCloud. No video support though. I recently purchased and downloaded ‘Capture 365’ and ‘Day One 2’ for my MacAir and the Iphone. After using both the apps for a few days I decided I liked Capture 365 better than Day One 2. At the present time it’s missing a few features that Day One has such as multiple journals but I think it’s a slicker journaling app. The support for Capture 365 is very good and I’m told by the developers that multiple journal support along with other features will be included in future releases. 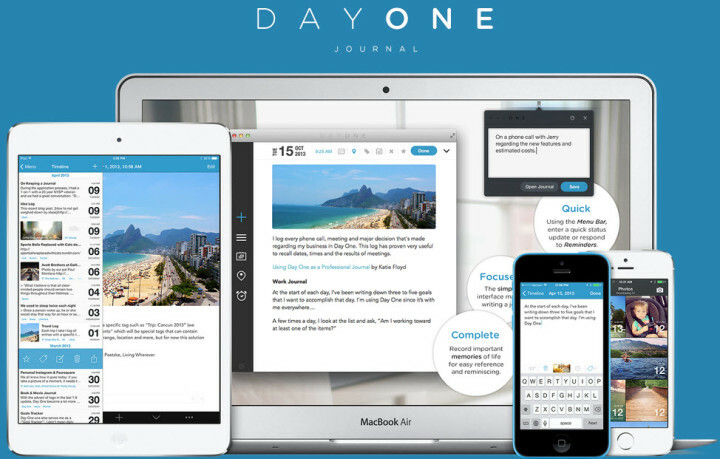 If Day One is rumored to be the best journaling application, Capture 365 is something to consider instead. Anyway not affiliated but worth a look. I love them! Try Stiya. Its free and will add photos automatically for you. You can always edit manually, change and delete photos. I’m a fan. I’m looking to keep a photo journal with the end goal of printing a book each year. Do you know if any of these apps have an automatic book feature, where you simply make your daily entries and then they organized it into a sleek looking final product? I use penzu, but some are new which i never heard off thanks for sharing! Evernote and the IF app can be combined to create an IF recipe that copies all Facebook posts (or Tweets) to a single note in Evernote. You can also set them up to download a copy of all pictures in which you are tagged on Facebook to Evernote. I don’t believe they will download past status updates, but do a good job of recording them going forward. It looks like Flava isn’t available anymore, and from posts I’ve seen, they didn’t give users notice that they were shutting the site down. Several commented that they consequently lost all of the journal entries they had entered into Flava. Any other suggestions that work with IOS and Web? I’m ‘write’ there with you Mishell; would love to have a way to scribble notes with my Apple pencil on my iPad Pro. Notability is my go-to note writing app and that could work, but all of my journaling is in Day One (I’ve been using D1 for a few years now). I do see many things that could be used as journal, but I’m keeping a lookout for someone to provide an app that’s laid out like a digital journal app, allowing you to write your entries. Like you said, I’m sure someone will, eventually! Actually I received the shutting down notice for only once one month ago before the app gone, but it didn’t give any clear instructions about how to back up, so I just left it at that moment and did not take it very seriously..but its still shocking that everything has gone at the end. I am looking for some app just exactly like Flava that automatically log you out when you close the app and needs passcode every single time you try to open it. Yes, I miss Flava! I loved how it was so easy to document movies, books, songs, links, etc that I liked, as well as my mood and the weather! The app was terminated so abruptly, and now clicking on/searching for Flava leads you to a so-so journal app called me.time. I really like you app & blog feature. I don’t recall all the functionality offered by Momento but I would say that you should take a look at the Day One app. That is probably the premier journal app now on iOS and OS X. Man, you didn´t have conclusion! I looked through all the apps mentioned above as well as those recommended by the comments below but what I’m really looking for is an app that consolidates all these other apps, e.g. I want to be able to view my data from Moves, Foursquare/Swarm, MyFitnessPal, Glow, Runkeeper, etc etc on a day to day basis on 1 app. It will be so useful to see by date how many steps I’ve walked, how many calories I’ve burned, how many calories I’ve taken in, where I’ve checked in and sort all these information by date. Is there such an app available out there, I wonder? I’m looking for a journal that I can input through voice recording. Been tossing this idea around of building it myself. Like Jenn, above, I’m looking for something I can print out to keep as a hard copy at the end of the year. do not use Penzu…they over charged me by $30 and after writing multiple times finally over a week later they tell me it will be several business days before the refund can be processedl. They have NO customer service and you have to write multiple time to get a response. Mark – Im looking for a recommendation for a journal for my young daughter – so I can write to her everyday and put pictures she 1 year old and I would have liked to fo this long ago – I tried Evernote but it’s not idealand no pictures really. Suggestion? Thank you for the listing. I find the one suit me finally! Is there a free journal app that allows for speech to text or just audio enteries? I would be overjoyed if it also allowed for seamless blog posting as well….any of you brilliant young people have suggestions or guidance?